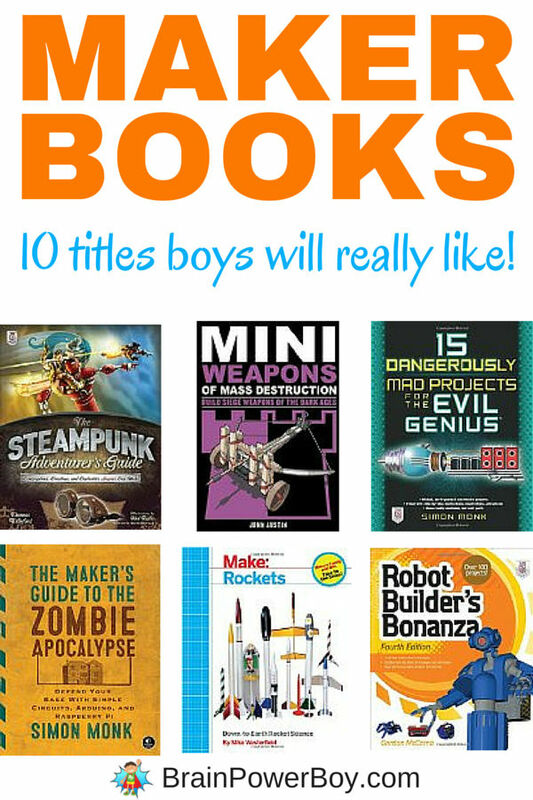 Maker Books Boys Will Really Like! Get these maker books for your boy and you will see him delve into the world of makers. The learning that occurs by using just one of these titles is incredible. I have seen it first hand. What is the maker movement all about? Well, that is simple: making stuff! Good old-fashioned, hands-on, enthusiastic making. I went through the available maker books and cherry picked the ones I thought boys would really like. You know, titles with robots and rockets, steampunk and zombies, hovercraft and weapons. Great, right?! Be sure to stop by our best books for boys lists to see what other awesome titles we picked especially for boys. Steampunk anyone? The Steampunk Adventurer’s Guide: Contraptions, Creations, and Curiosities Anyone Can Make This book actually includes a story and super companion projects that use fairly normal materials and that don’t cost a small fortune to make. Make: Rockets: Down-to-Earth Rocket Science (down to earth, and it is rocket science – ha!) This book is all you need to make math and science interesting! They will learn to build and fly “solid propellant, water and air powered rockets” and have a blast while doing so. Check out Make’s website for more ideas. I couldn’t do a maker book list without adding robots, now could I? Robots are a perennial boy favorite and this is the book to try if you want to make your own. Robot Builder’s Bonanza covers all things robot from making them out of toys and found parts, to robot electronics, to microcontrollers. 15 Dangerously Mad Projects for the Evil Genius What an awesome title for a book! This one includes plenty ways to make things to shoot stuff, create a spy bug, build a flash bomb, and more. Fill up the bathtub or a swimming pool! You will need a place to launch these cool motorboats. The Motorboat Book: Build & Launch 20 Jet Boats, Paddle-Wheelers, Electric Submarines & More This title looks great and we can’t wait to try a few of these projects. If you don’t mind projects of the weapon variety (and most boys love these) you have to try: Mini Weapons of Mass Destruction 3: Build Siege Weapons of the Dark Ages The whole series is good. Book one is Spitball Warfare and books two is Build a Secret Agent Arsenal. This book covers siege weapons. Building mini siege weapons is a lot of fun and shooting them is even better. Make your own toys because playing is only half the fun. Zany Wooden Toys that Whiz, Spin, Pop, and Fly includes 28 projects to make. The projects are designed for the beginning woodworker and go way beyond birdhouses to allow for fun toys that boys will not only enjoy making but will have a good time playing with as well. Not for young kids! The details at the beginning of the book including a beheaded zombie might not be something you want to share with them. However, the book is packed with a neat concept that I know zombie crazy boys are going to like. The Maker’s Guide to the Zombie Apocalypse: Defend Your Base with Simple Circuits, Arduino, and Raspberry Pi will have them learning a LOT. It covers generating and using electricity, making alarms, surveillance, detecting open doors, communicating with others, building a control center and more. Engaging way to learn! Oh boy! How to Build a Hovercraft: Air Cannons, Magnetic Motors, and 25 Other Amazing DIY Science Projects A hovercraft? Yes, really. These projects are really cool and there are ideas for every skill level. Plus, honestly, even if your boy is just starting out it is likely they he will want to learn more and more so he can complete the ideas in this book. Wow, that is one great selection of maker books. I hope you and your boy find some cool projects to do. Grab one (or several) of these books as a gift or send him a package in the mail “just because.” I love to do this! I order a title from Amazon, have it sent here and hand it to my son when it comes. Surprises are fun.